9 to 5 Mac came out with evidence over the much anticipated next-generation iPad. 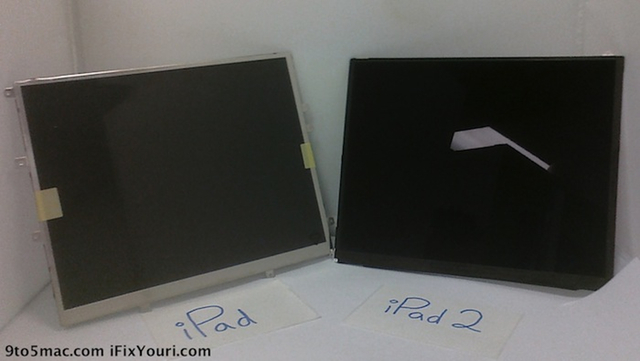 From many pictures shown, it is clear that the iPad2 will have a thinner display but will not support high definition retina class display. 9 to 5 Mac got its hands on the display from China and from the repair firm iFixYouri. From the number of photos posted on the site a part number was identified as LP097X02-SLN1 which is a LG Phillips 9.7-inch XGA display. The display is H-IPS and has a resolution of 1024×768. If it is indeed slated for the iPad 2, then the resolution will end up being the same as the current-generation iPad and will not have a Retina display.